The worst thing about Christmas is that it makes winter longer, and unbearably so. Thanksgiving ends and suddenly it’s supposed to be Christmas, even though there are still orange leaves here and there, which some people—I would venture to say a lot of people—like. Fall is tolerable enough that we don’t need to run out the clock on it, and yet we do, by sticking Christmas right after Thanksgiving, when as a group, we are tired to our bones, but not of the right things, and unable to admit it. We’re tired of our families, of hearty foods, of holidays themselves. You know you’ve got a problem on your hands when you’re literally tired of love. 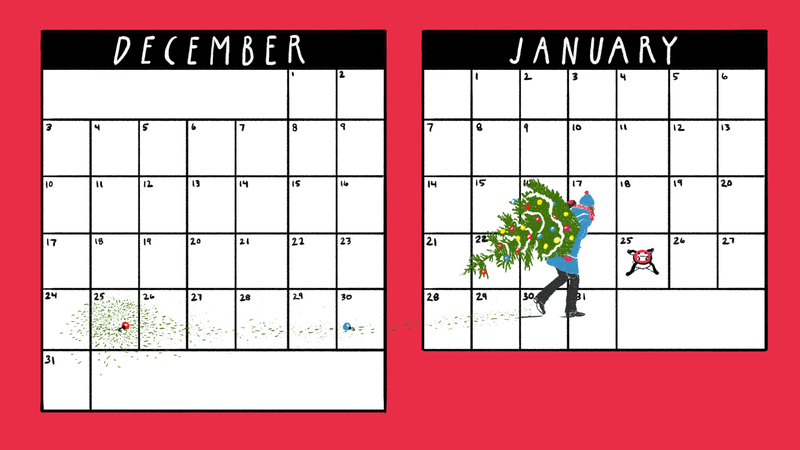 Why not give ourselves a break and move Christmas to the end of January? Our current calendar is childlike and impulsive. Christmas and Thanksgiving jammed together is money spent the moment we earn it. It’s two naps on Saturday morning, and none on Sunday. It’s a sandwich at the second mile of a marathon, then a hot dog at mile four. It leaves us limping the rest of the way with a cramp we gave ourselves. It’s a break we see as work because of all it entails. But more to the point: it’s still fall in December. My former colleague Jia Tolentino once argued, about fall, that “‘Things getting cold’ is just not a theme worth honoring.” While I agree, it’s how things are. It’s questionable that this is so, but it remains the truth that Christmas celebrates winter itself as much as it celebrates anything else, and it is psychologically unmooring to pretend to be having an experience other than the one you’re actually having. The message snowflakes taped to preschool windows and blow-up Santas on stoops sends is that you should have noticed that it’s winter. But it’s not. To call the game on the carpet is a betrayal of the season; it’s un-American; you’re a grinch. This is the psychological equivalent of wearing a wool sweater to the beach or drinking hot chocolate at a barbecue but being told it’s a cold beer. The earth’s axis is tilted in such a way that the first day of winter is December 21st. All that seasonal cheer is aligned for four days, and then we have to trudge through three months of dark, uncelebrated winter. Then it’s New Years, and you better take down the tree or get called a hoarder by your judgmental adult son. Maybe it snowed, maybe it hasn’t. If you live in most of the continental United States, it probably hasn’t. How depressing. New Years is a perfect holiday because unlike Christmas, you lean into it at will; celebrate it or don’t, with friends and family or without. Eat a goose, eat Chinese food, eat a burrito, eat whatever. No one really cares. In fact, it’s the perfect holiday to sit squarely between Thanksgiving and (New) Christmas because if you could use some celebration, go nuts, but if you’re still recovering from Thanksgiving or are out of money, you can drink cheap prosecco alone in a bathtub, mostly without societal derision. Then it’s January, and all that snow you ordered has finally shown up, but you’re out of vacation days, so you can’t luxuriate it and give hygge a whirl. In front of you stretch three months, lazily glaring at you with the lights off. Kelly Conaboy thinks the answer is to keep the festive lights on. She might be right, but it’s nice to take a break from being on, whether you’re a person or a light. And it would be nice to do that without thinking your only bedfellows from here on out are going to be Valentine’s Day and St. Patrick’s Day, winter’s unbearable daughter and degenerate son. Wouldn’t it be nice if you could make it through January knowing there was a reward at the end? This is what I’m saying. You may think that to take such a viewpoint would require a person love, celebrate, or at the very least observe Christmas. You would be wrong. I don’t really love Christmas, and this is my idea. I find that as a holiday, it can hurt; memories show up when they’re not invited, and they’re often dressed somberly when it’s supposed to be a party. Other people, in lit windows across the street, in my phone, or in my imagination seem to be having more fun. The religious get righteous and the nonreligious are worse. At Christmas, the rich seem richer, the poor seem poorer, and my heart aches a lot of the time. I can’t solve that. But maybe everyone would be in a better mood in January if they got a few days off at the end of it for a holiday, even one they don’t care for or celebrate. People who don’t observe Christmas might even be spared some of its cloying pageantry if we went with my plan. Maybe Christmas wouldn’t be such a big deal if it didn’t come 45 minutes after another Major National Holiday and it wouldn’t make those whose families don’t observe it feel so left out. And those who do observe it might be in a better mood if they didn’t have to pat their mothers on the shoulder when they complain about how they “always want a snowy Christmas and never get it.” Maybe if they’d had a little more time to buy all those gifts that every year I keep trying to get out of both giving and receiving, we could all relax a little bit. About those gifts. I hate to talk about “Christmas creep,” but it’s the white elephant in the room. People hate Christmas creep, but retailers demand five weeks to sell you stuff, and they’re gonna get it unless we seize the means of production, and these days that seems more far-fetched than changing the date of Christmas. Let’s put a pin in workers of the world uniting—a thing I am decidedly for—and focus on how great it would be if you didn’t receive any emails imploring you to buy “last-minute gifts for dad” on November 30th. What if Christmas creep started the week before New Years? Wouldn’t that be preferable to being told, before the pumpkin pie has even left your small intestine, “You’re late to Christmas. Spend money now”? I hear someone in the back muttering, “Guess Jesus can just move his birthday.” To which I say, “I heard that, and yeah, I guess he can!” My birthday is over Memorial Day weekend, but I usually go out for a nice little dinner on Tuesday once my pals get back in town. I can handle it, and God isn’t even my dad. I’m sure Jesus can handle it. This isn’t just a solution to everything, it’s an opportunity: If your problem is you like seasonal lattes, drink pumpkin spice until December 21, and then start in on peppermint and cruise right through Christmas on January 25. You actually get more months of seasonal latte this way. Careful readers will note that, thus far, this has been a mostly meteorological argument dressed up as a cultural request. But just because you live in Florida doesn’t mean you couldn’t benefit from (New) Christmas. Unfortunately, someone (not me), shelved the overthrow of capitalism, so should you be so happy as to find yourself employed, you probably can count on being chained to your job for the rest of your life. It is cruel that America’s retail workers, maybe including you, have to work the most challenging day of the year mere hours after Thanksgiving. Let’s have black Friday be after New Years, the greatest holiday of them all for the reasons I covered above. It’s inconvenient that at Jezebel, we have to get together our “end of year content” while half of us are on vacation. Many of America’s workplaces awkwardly force the economic necessities of the end of one year and the beginning of another to happen while their workers are trying to relax. Surely, if you live in warm places, these conditions still apply. The time between Thanksgiving is thought of as a sort of dead time, and yet so much has to happen. The culprit? Christmas unreasonably crammed in the middle. January, as a result, has become a flat time. There’s nothing but hard work and low light. It’s a good time for dental appointments and worrying about your station in life. It’s a month we use to “buckle down,” to order and eat salads, to buy humidifiers, and catch colds. Celebrations are over in January, and any part of your heart that was twinkling must now devote itself to tracking down your W-2. Why couldn’t we do all this with festive lights up and a tree in the living room? January is black coffee and cold feet, and I’d like to at least be able to throw a little cinnamon in that coffee without feeling like the last one the leave the fair. Winter is long enough without burning through the one nice thing about it on the fourth day of the season. I don’t think this nation is going to make it though another four-month winter with nothing to brighten it up but novelty condoms and green beer. This Christmas, when you find yourself annoyed to be seeing everyone a month after you just saw them, bothered by the way your sister says “milk,” or simply and indiscriminately burned out on holidays, consider that it could be different. This winter, when you’re trudging home from work in a jacket that isn’t quite warm enough, from a job that doesn’t quite pay enough, to an apartment that is either a little too hot or a little too warm, jolly lights and the comfort of loved ones and seasonal beverages miles behind you in the rear-view mirror, ask yourself if you might have had yourself a merrier little Christmas if it had come in January?